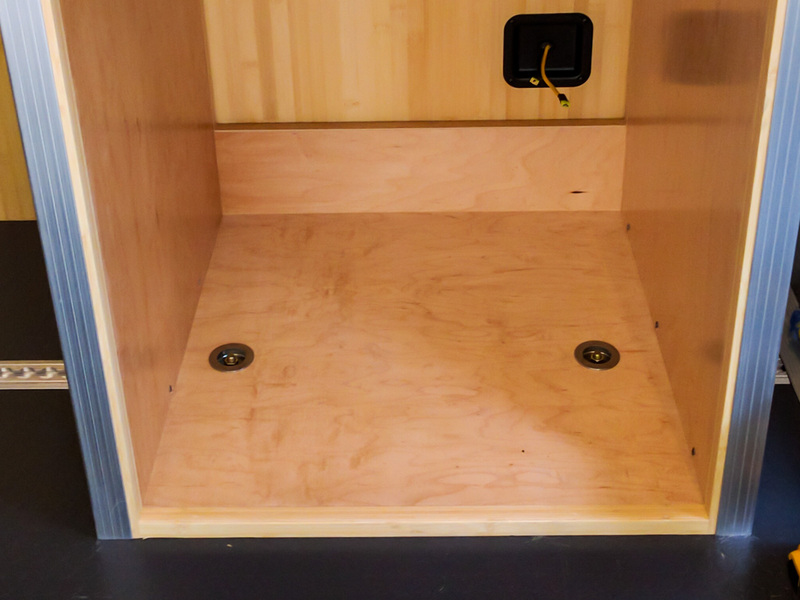 Our cabinets can be bolted in and out of the van as we need them. 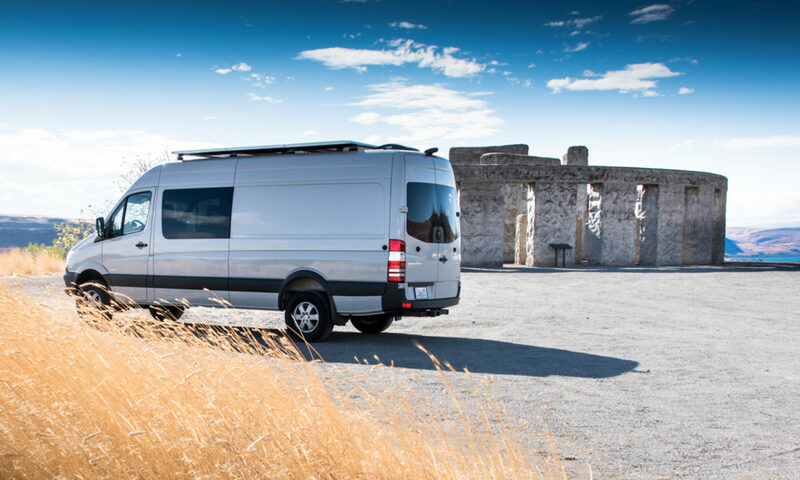 The plan is to keep them in place most of the time, but it’s great to be able to reconfigure the van as we need it. 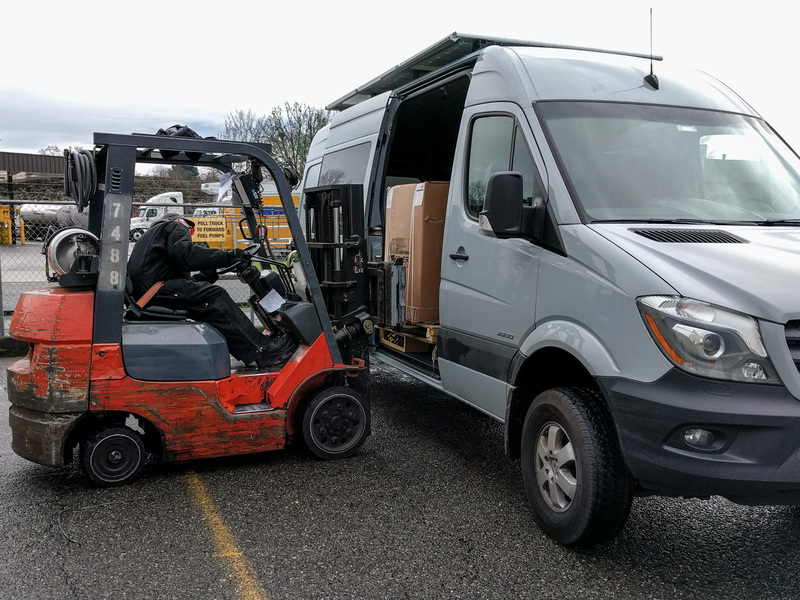 We collected our new air ride driver and passenger seats from the shipping terminal rather than paying an additional $95 to have them driven 45 minutes to our house. That meant we had to take out the cabinets so that the pallet that the seats were on could fit in to the sliding door area. We just put the cabinets back in again ready for our next trip. 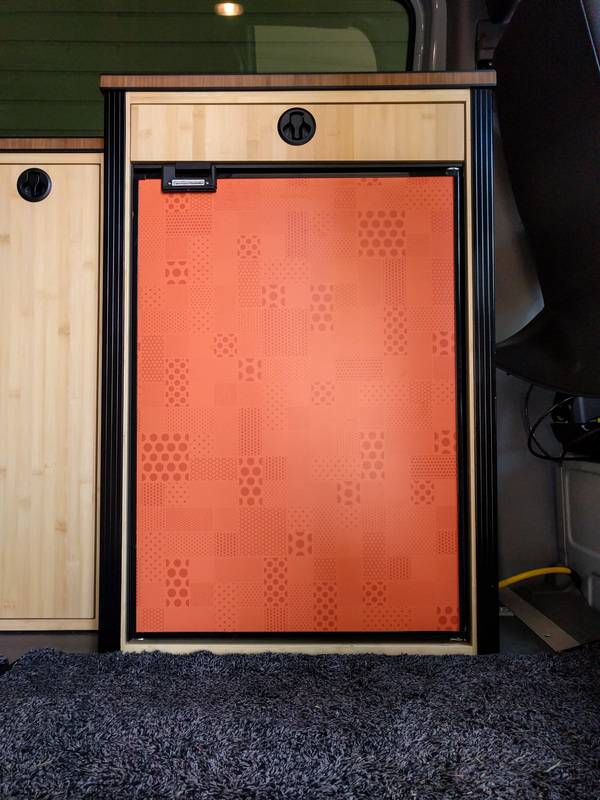 While they were out, we added countertops and painted the aluminum corners black to better match the look of the rest of the van. It takes about 30 minutes to remove all of the cabinets. The fridge (six screws) and microwave (three screws) have to come out of their surrounds, and we have to take a couple of drawers off their quick-release sliders. That gives us access to the two wall bolts and two floor bolts per cabinet. 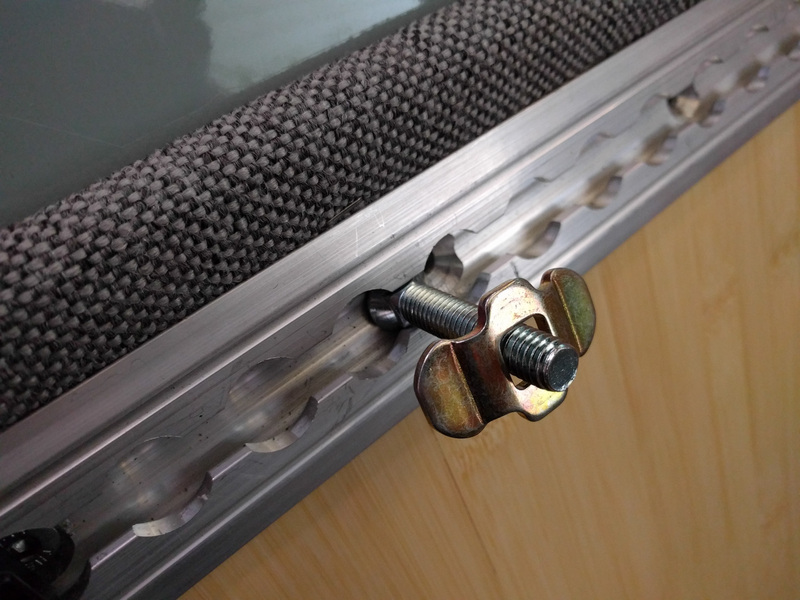 Once the nuts are unscrewed from the bolts, the bolts clip out of the Steadymate L-track and the cabinet is free. At that point, the cabinets can each be lifted out of the van and stored. They are not light – it’s a two-person job – but they are maneuverable. Amazing build. Great write up. I use you as one of my go to resources as I build. Was wondering where you found your l-track mesh bags? Derek, all the bags are regular car organizers with grommets added in the right place to clip on to the L-track. We wrote about them here. Where did you find the extra long fastening bolts for the l-track? All the stock bolts are only 1 in long which is too short. Mark, we got our bolts from Tacoma Screw. They will deliver, or you can pick the stuff up if you have a local store. I’ve listed the 30mm bolts (just over 1″) but we also used 50mm bolts to go through the floor. The metric stainless bolts have a slightly different countersink angle to the imperial ones, but for the types of uses most people put L-track to, it’s probably not a big issue. Use a good grease or anti-seize on the threads and between the bolt head and the aluminum track. You want to prevent thread galling with the stainless bolts and nuts, and galvanic corrosion between the stainless bolts and the aluminum L-track. I don’t think Tacoma Screw sell imperial-unit stainless flat head screws. At least, they didn’t when we bought ours. And anyway, it’s a metric van, right? I should have checked the website prior to responding. Looks like the parts you listed were for attaching the L-Track to the van. What I am looking for is a longer bold for the l-track that is then used to fasten the cabinets to the l-track. It looks like you took a standard L-Track Threaded Stud Fitting and replaced the bolt with a new longer bolt (with the square fitting between the bolt head and the start of the threading). Ah, yes – sorry Mark. Those are Plow bolts. They have a flat head, a square section just under the head, and then the threaded portion. They are similar to carriage bolts but without the domed head. If you find one with the same thread size as the L-track bolts you should be fine. Sorry, I don’t have a link for those. We found them at our local hardware store. Dave, our refrigerator cabinet is not built out of 80/20. We plan on rebuilding it soon, and we’ll share the plans when we do. Drawers are an issue when you’re using 80/20!